The story of the Vegas Golden Knights’ inaugural season just continues to get better. On Tuesday night, the Golden Knights beat the Los Angeles Kings 1-0 to sweep the best-of-seven first-round series. 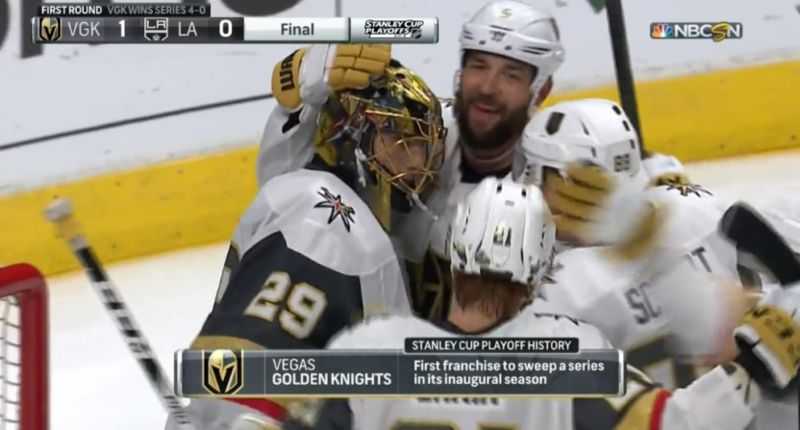 In doing so, the Golden Knights became the first NHL, MLB, or NBA team to sweep a best-of-seven series in their inaugural season. The Vegas Golden Knights have become the first NHL, NBA or MLB team to sweep a best-of-seven in their first playoff series in their inaugural season, because of course. We just really want to experience it all this year ? The Golden Knights will look to keep their magic going in the second round, where they’ll likely face the San Jose Sharks (up 3-0 in their series against the Anaheim Ducks). At this point, we should no longer be surprised by what they do, and maybe they really do have a legitimate chance to make a run at the Stanley Cup.